Blue Black ink goes in any every day writing pen and nib combination. Stock Fine Japanese nibs for example. The same goes for Orange, although it will find its way into finer nibs more often than Blue Black. Bright Blues, on the other hand, tend to find their way into the extreme ends of the nib spectrum. XXF, UEF, and PO on the fine side, and big stubs on the broad side. I almost never use them in the middle range of nib sizes. Why is that? Bright Blues offer the perfect amount of character and readability for the nibs I use them in. Blue Black inks are arguably more readable on the micro side of the ledger, but will lose their character when the line is that fine. Conversely, they are a bit boring on the wide end. There are inky exceptions, of course, but in general terms I find this to be the case. Orange inks look cool in micro nib sizes, but they are more difficult to read. Wide nibs tend to show off their brightness, but they often lack the big shading and sheening characteristics that other colors have. Bright Blues, like Robert Oster Blue Water Ice, are my favorite in nibs that aren’t covered by Blue Black and Orange. For this review, I used my Pelikan M805 Demonstrator with a Medium nib modified to a stub by Dan Smith. As wide as stock Pelikan nibs already are, this made the line somewhere around a 1.0 mm stub, which shows off the characteristics of Blue Water Ice wonderfully. This is a moderately shading and light sheening ink. There is good color variation within the line, and the edges show off a bit of red sheen that stands out the more characters there are on the page. In pictures and swabs I thought it would be similar to Pilot Iroshizuku Kon-Peki and Sailor Sky High, but in use it is lighter and greener, despite what my premier photography skills show in these images. Because of that lightness, it is the perfect stub nib Bright Blue ink. It would be difficult for me to choose Blue Water Ice over Kon-Peki, for example, in something like my Pilot Custom Heritage 912 with PO nib. It would work just fine, but it wouldn’t be the best experience for me. And that’s what fountain pen inks are for me: An experience. Finding that perfect match of ink color, nib, pen, and paper is something all of us fountain pen fans strive towards. That’s why we obsess over the little things, such as one ink being perfect for a fine nib, but not necessarily a medium nib. That’s why when we find that combination we go to it over and over again. And that’s what I find so fun about this crazy little hobby of ours. Posted on April 1, 2019 by Brad Dowdy and filed under Robert Oster, Ink Reviews. This week I’m doing an overview of five J. Herbin inks. I won’t review each ink in as much detail as I usually do, but I wanted to introduce each ink with a few comments about color, saturation, and wetness. These five inks come in adorable 10ml bottles (though you can purchase larger 30ml bottles). The 10ml bottles aren’t very practical, however. Since they are so small, the opening won’t accommodate bigger nibs, such as the MB 149. Still, they are a nice size for travel or for an office stash of ink. The colors range from a very light coral to a deep purple blue. 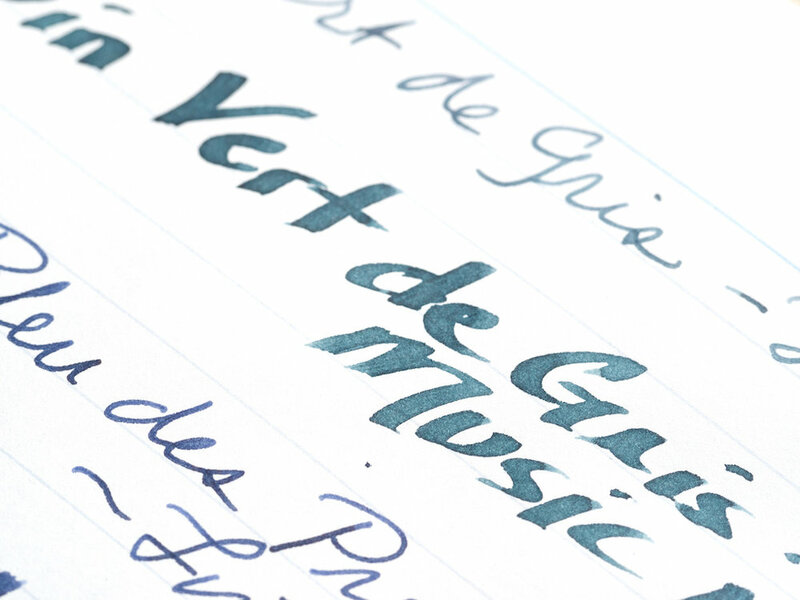 The first ink is Vert de Gris. This, in my opinion, is the most unique color of the five inks. “Vert de Gris” means “Green-Gray” and this color has both deep turquoise and gray hues. It is gorgeous in fine and broad nibs, and it exhibits good shading but no sheen. The second ink is Bleu de Profondeurs, which means “deep blue.” This ink is a purple blue. It’s nicely saturated and looks good in both fine and broad nibs. In broad nibs it offers a little bit of shading, but no sheen. 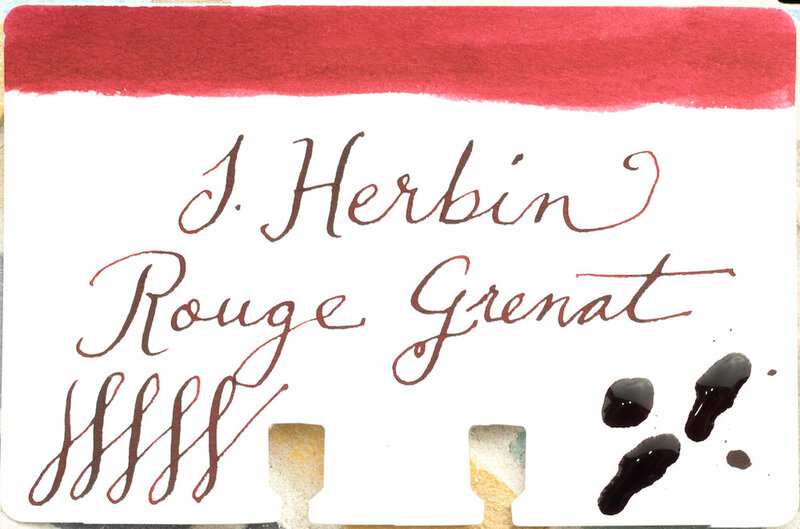 The third ink is Rouge Grenat, which is a lush garnet red. The ink works well in both fine and broad nibs, and is highly saturated. Although it doesn’t have any observable sheen, it does exhibit a little bit of shading in broad nibs. 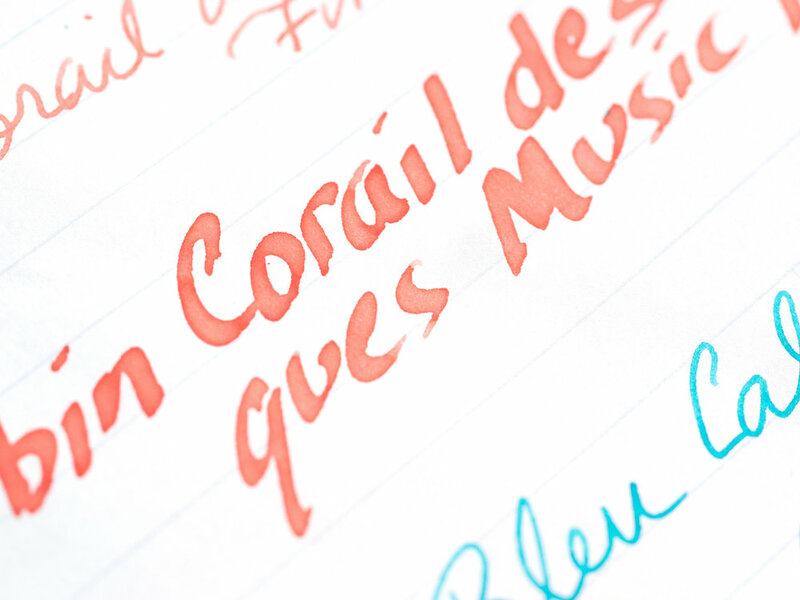 The fourth ink is Corail des Tropiques. Of the five inks, this one is my least favorite, mainly because it’s watery and too light for use in finer nibs. It might work well as a wash. In broad nibs it has enough saturation to be usable and even has a tiny bit of shading. In my testing it exhibited no sheen. This is a bright turquoise color that is saturated enough to work well in fine nibs. It also exhibits a bit of shading in broad nibs. 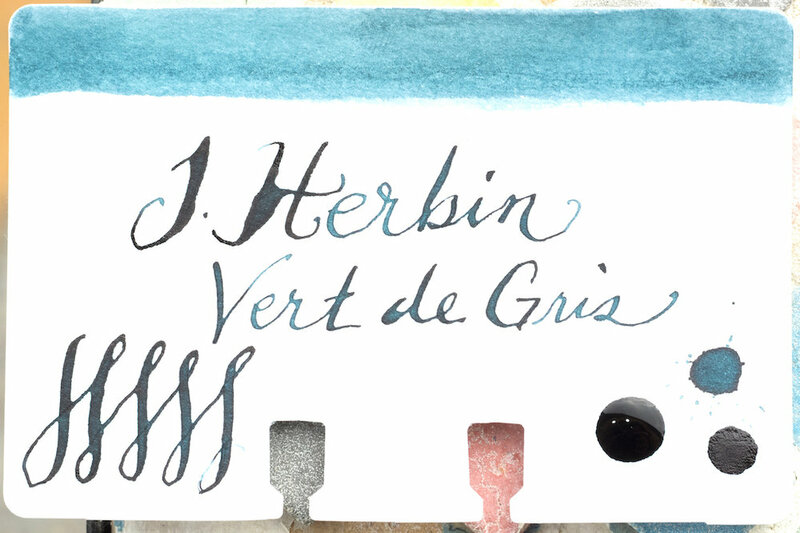 I like all of these J. Herbin inks--in fact, they surprised me. They are far more saturated than I expected. I’ve found J. Herbin inks can be too light and very dry (I’m thinking of you, Rouille d’Ancre). These five inks flow quite well, though Corail des Tropiques was too watery for my taste. The 10ml bottles are a good size for sampling an ink. Unlike typical 4 or 5ml ink samples, you have enough ink for several fills so you can decide if you want to buy a regular sized bottle. You can purchase J. Herbin 10ml inks from Vanness Pens for $6.00 a piece (30ml bottles are $12.95). Posted on March 8, 2019 by Susan Pigott and filed under J. Herbin, Ink Reviews.